The FCC says it will propose Internet regulations that would allow online content providers to negotiate for preferential treatment from Internet service providers, potentially undermining the principles of net neutrality. A Federal Communications Commission statement obtained by Mashable on Wednesday leaves open the possibility that companies could pay Internet service providers (ISPs) to get better access to consumers. Net neutrality regulations previously required that all Internet traffic be treated equally, but those rules were struck down by a U.S. court. n essence, the proposed rule change might mean ISPs such as Comcast or Verizon could negotiate with content providers like Netflix, Amazon or Skype, and charge them for faster delivery of their content to U.S. consumers. ISPs such as Comcast or Verizon could negotiate with content providers like Netflix, Amazon or Skype, and charge them for faster delivery of their content to U.S. consumers. But the ISPs would probably have to offer a "baseline level of service" for all sites, even those that didn't pay an extra fee. However, FCC chairman Tom Wheeler issued a statement late Wednesday, refuting claims that the new rules would destroy net neutrality. "There are reports that the FCC is gutting the Open Internet rule. They are flat out wrong," the statement said. "As with the original Open Internet rules, and consistent with the court's decision, behavior that harms consumers or competition will not be permitted," Wheeler added. An FCC official told Mashable that the proposed rules would still fulfill the goals of the FCC's 2010 Open Internet Order, which forms the basis of the previous net neutrality rules, but that a new standard would be created for "assessing whether conduct threatens an open Internet." That standard would apparently replace the discrimination clause of the 2010 rules, which forced service providers to treat all Internet traffic as equal. The FCC said that under the new rules, "broadband providers would need to act in a commercially reasonable manner subject to review on a case-by-case basis." It said it would seek public comment on "the construction of a 'commercially reasonable' standard, and the manner in which disputes would be resolved." Net neutrality advocates claim that a system that allows for discrimination would put Internet startups at a disadvantage, as ISPs would begin to favor established content providers that could afford to pay for better service. Corynne McSherry, intellectual property director for the Electronic Frontier Foundation, warned against rushing to judgment but said that the proposal was an ominous sign for net neutrality advocates. "There's still a fair amount of unknowns. We don't know what the details are," she said. "What I worry about is the next Netflix, the service that's developing in someone's garage right now that wouldn't be able to find new audiences because it wouldn't be able to pay the fee." Opponents of net neutrality regulation argue that ISPs should be free to control the content that subscribers access. The FCC's proposal would fall somewhere in the middle, allowing ISPs some discretion to negotiate with content providers while maintaining a minimum level of access and service to all sites and subscribers. In a statement issued to Mashable, the FCC said the draft rules would propose "that broadband providers would be required to offer a baseline level of service to their subscribers broadband providers would be required to offer a baseline level of service to their subscribers, along with the ability to enter into individual negotiations with content providers." The draft, written by Wheeler and his staff, will be circulated among his fellow commissioners on Thursday. They will vote on the proposal on May 15. 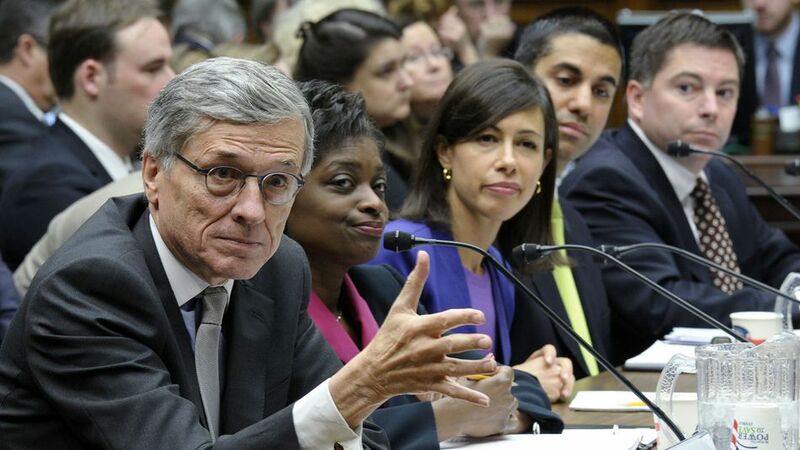 After a public comment period, the FCC will then write the final rules and vote on them. Net neutrality proponents are already reacting with anger to the potential proposal. "If it goes forward, this capitulation will represent Washington at its worst," Todd O’Boyle, the program director of Common Cause’s Media and Democracy Reform Initiative, said in a statement. "Americans were promised — and deserve — an Internet that is free of toll roads, fast lanes, and censorship — corporate or governmental. If Wheeler’s rules deliver anything less, that would be a betrayal." McSherry said the requirement "to offer a baseline level of service" to subscribers could preserve some guarantee that ISPs would not be able to require all sites to pay fees for accessing customers. The specifics, she added, would be essential to understanding the full ramifications of the proposed rules. "The bargain that they seem to be proposing on the other side limits or restricts blocking specific sites," she said. "That might be positive. The devil is really going to be in the details." The NPRM [notice of proposed rule making] will propose, consistent with the Court’s analysis, that broadband providers would be required to offer a baseline level of service to their subscribers, along with the ability to enter into individual negotiations with content providers. In all instances, broadband providers would need to act in a commercially reasonable manner subject to review on a case-by-case basis. Exactly what the baseline level of service would be, the construction of a 'commercially reasonable' standard, and the manner in which disputes would be resolved, are all among the topics on which the FCC will be seeking comment. There are reports that the FCC is gutting the Open Internet rule. They are flat out wrong. Tomorrow we will circulate to the Commission a new Open Internet proposal that will restore the concepts of net neutrality consistent with the court's ruling in January. There is no ‘turnaround in policy.’ The same rules will apply to all Internet content. As with the original Open Internet rules, and consistent with the court's decision, behavior that harms consumers or competition will not be permitted.